New to RV ownership, bought and started restoring 1974 Winnebago Minnie Winnie. Alright, well now that I have roof that will not collapse under my weight…(I hope)…I have started the install of the new roof vents. This is a fairly minor project, but I was happy to be able to get the roof sealed from all of the known leaks! Ok, so next step in the roof ceiling repair…. 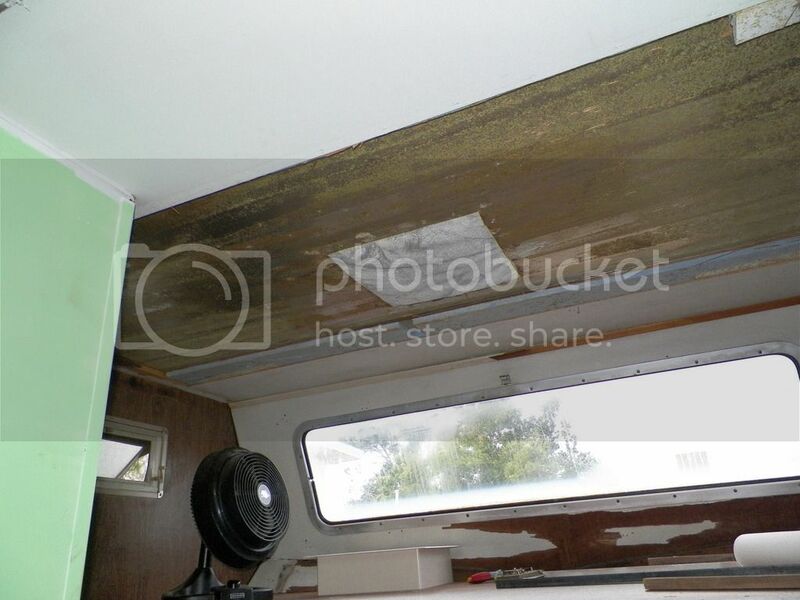 I wanted to install the panel into the ceiling. I had been happy with the Epoxy resin I used to assemble the panel so I wanted to try using this same method to attach the panel onto the aluminum skin. Slight change of direction over the weekend, I have been looking for a replacement A/C unit for the Minnie-Webbie to upgrade the broken, dirty old swamp cooler that was currently installed on the RV. Well I happened to find a A/C unit advertised on craigslist on Friday, very near my house. So, I went and checked it out, it looked and tested fine (owner had it set-up and working in his garage). I debated on several different repair techniques before starting but I ended up deciding to cut out the bad area and install wood for reinforcement rather than duplicating the standard construction techniques. Since I did not have a way to screw in the 2X4 from the outside I decided on good old liquid nails to hold the wood in place against the outer skin.